So… This week I created my first “tablescape.” Our dining room table has been naked since we moved in, and on Monday I was inspired to change that. 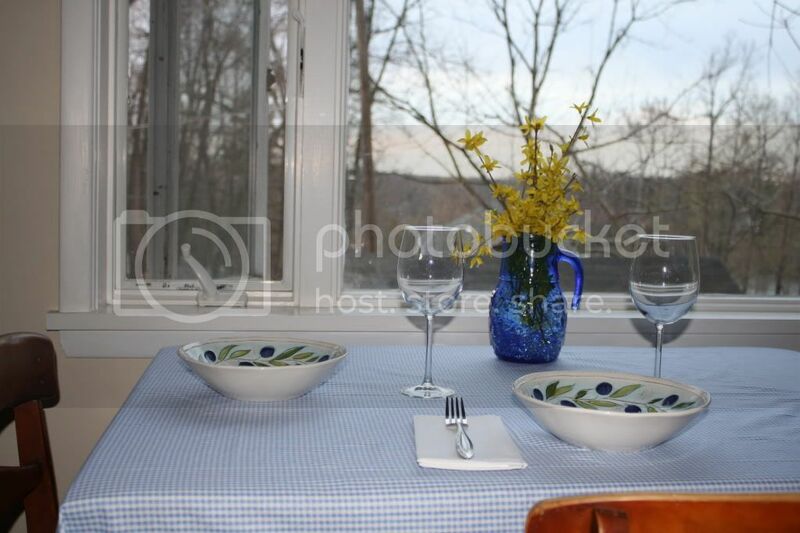 Blue and white checker table cloth, white napkins, Crate-and-Barrel bowls, and simple wine glasses. My favorite part is the centerpiece. We picked up this blue pitcher at a garage sale a few years back. 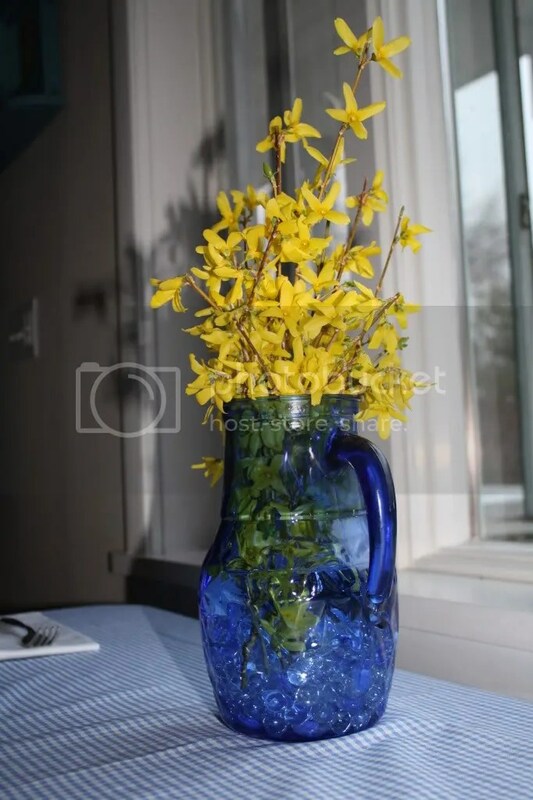 I went outside and snipped some forsythia from the huge, overgrown bushes in our yard. It is the perfect touch! Moving on to the food, which is why you are all here, of course. 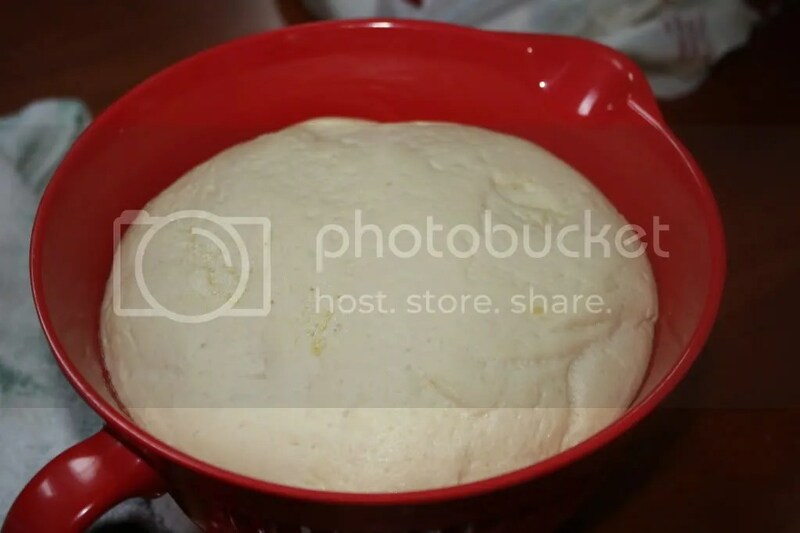 The last time I made this recipe, I was in high school. It was late at night and my best friend Kristie and I decided to make vodka sauce. I think we were the only kids that sneaked liquor, not to drink, but to cook with. Anyway, it was a disaster. 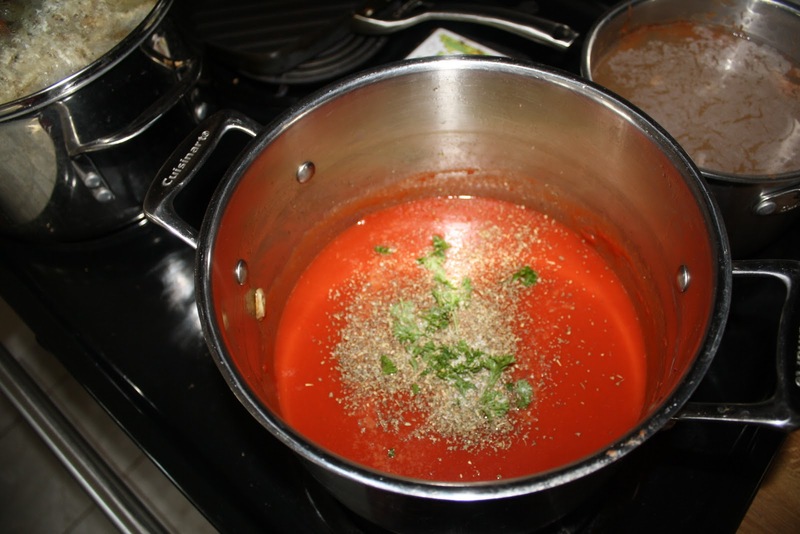 The original recipe called for canned tomatoes, which of course, we didn’t have. We took cherry tomatoes and tried to mush them up. That didn’t work, they just exploded everywhere. Then, it seemed that I wrote the recipe down incorrectly. The vodka measurement I wrote down was 2/c cup. When we make it, we put in 2 cups. FYI, that is a flammable amount of vodka. The stove went up in flames. Oops. 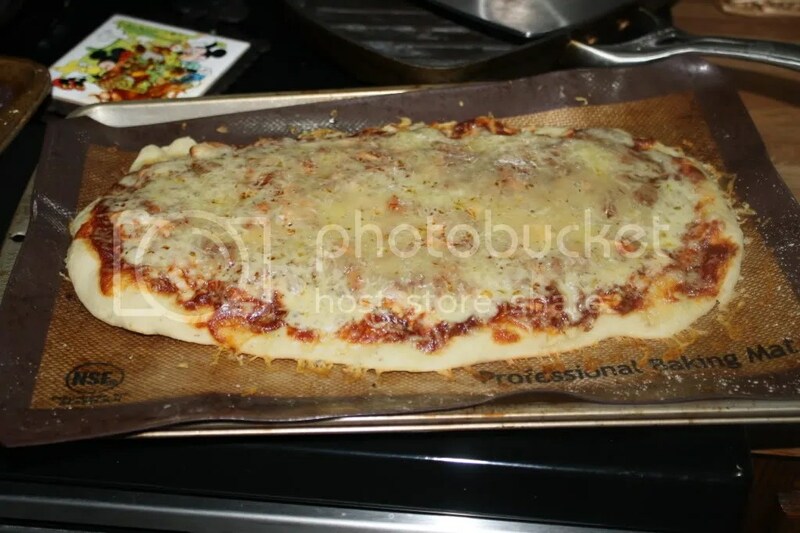 Now, a decade later, I decided to re-attempt that very recipe. 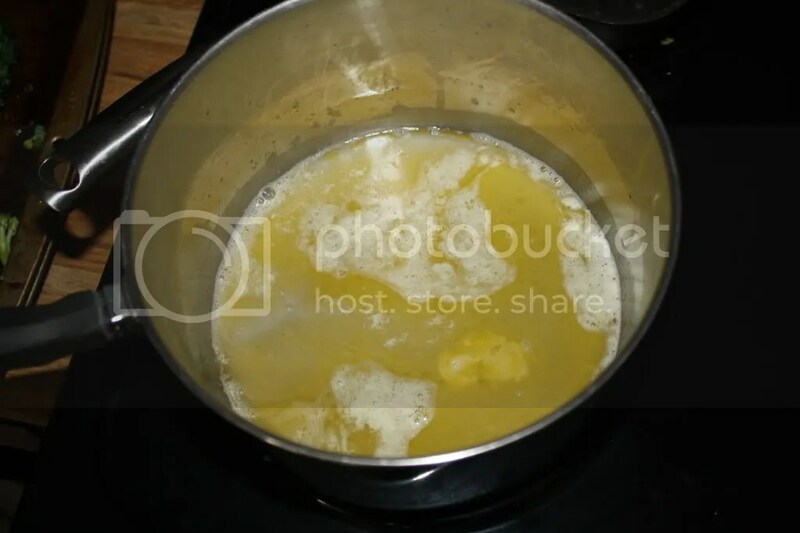 First, I melted down 2 tablespoons of butter. Then, I had to figure out what 2/c cup was. I settled on 1/2 cup. The rest of the recipe was easy. 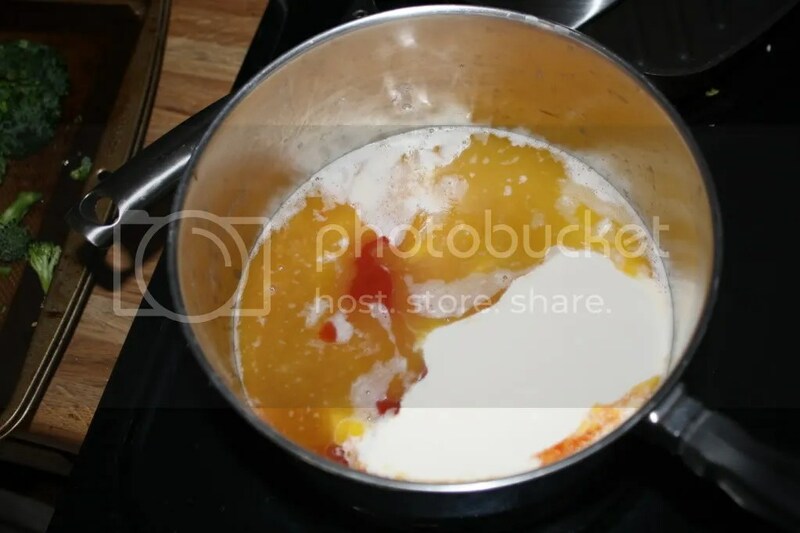 I added in my tomato sauce and raw milk cream. I mixed it all together and added some salt. It was so yummy! I poured it into a jar, and it is waiting to me mixed with rigatoni and peas! 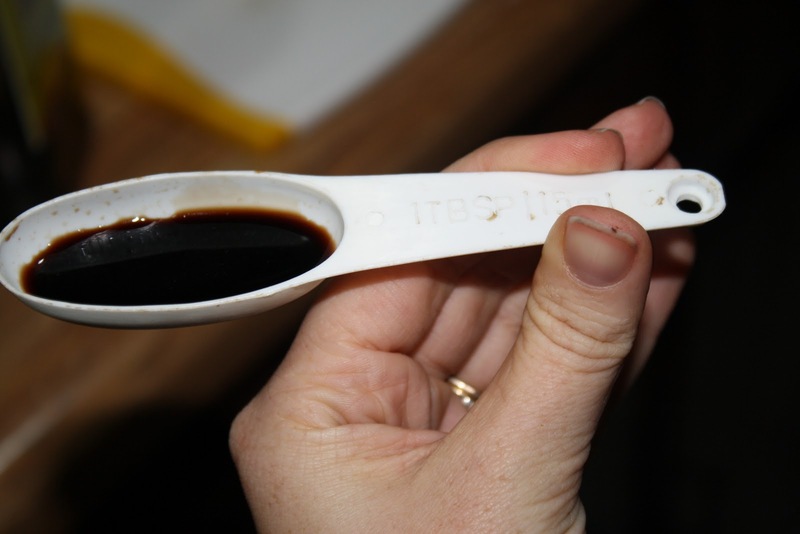 …and don’t worry, the cream in the measuring cup didn’t go to waste. 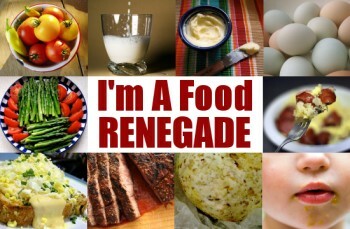 This post was featured on the Hearth and Soul Bloghop and Fight Back Friday with Food Renegade! 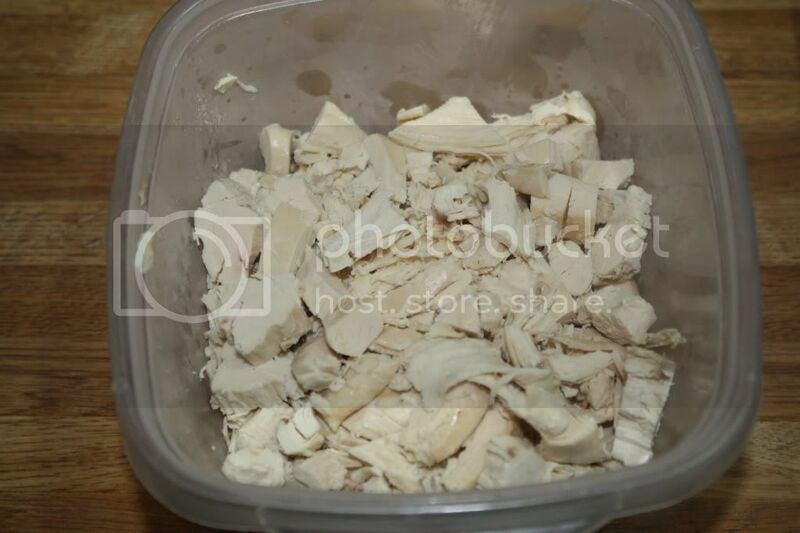 Categories: about us, dairy, macaroni, sauce | Permalink. Grandma’s Gravy Meat and Fun Facts! My grandma taught me how she makes her gravy meat and meatballs a few years ago. I have the recipe saved on stained and somewhat crumpled note paper and refer to it EVERY TIME, even though I know it by heart. The recipe isn’t even a recipe, really, but a list of ingredients and the order to add them. While I have made tomato sauce from actual tomatoes (a yummy tomato basil sauce), this is comfort food for me. I decided to make it recently, and thought it may be time to gently tweak it to align better with our food philosphies. Nothing major, of course, but little changes at a time. 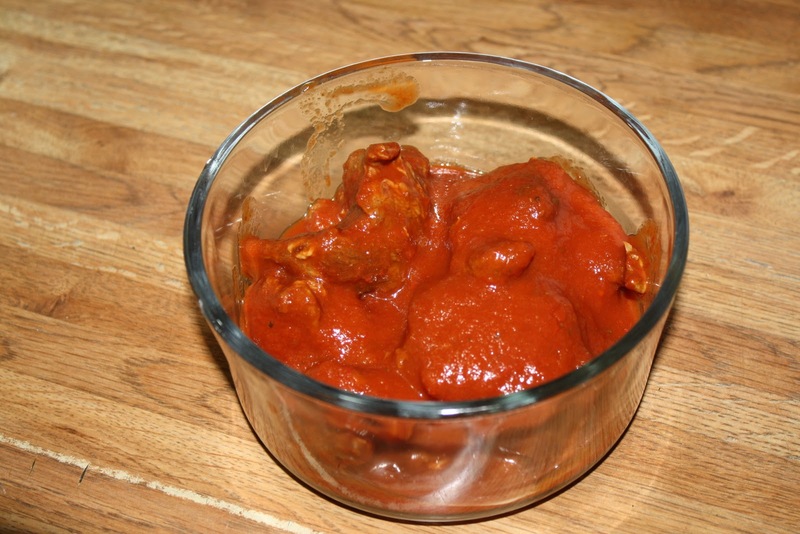 The original recipe calls for beef, pork, and veal as the gravy meat. To get all of those meats in the quality I would like (and raised the way I would like) would make this a very cost-prohibitive recipe. 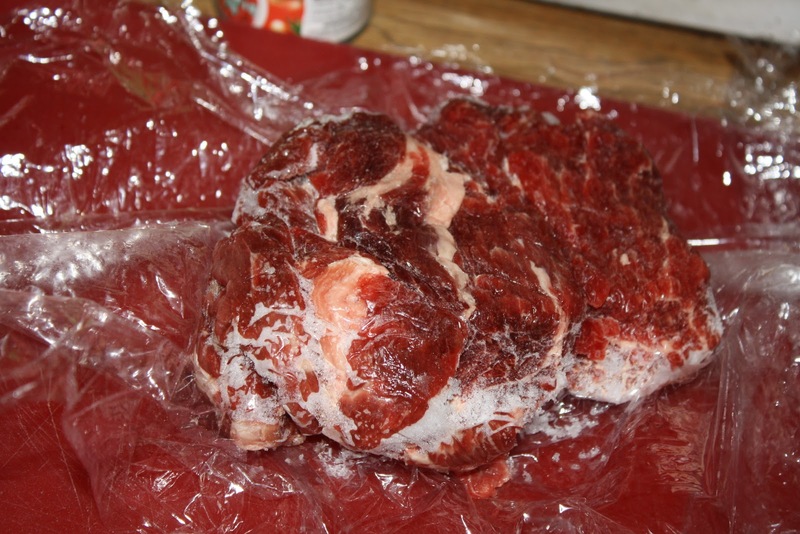 This time, I defrosted some grass-fed beef that we had gotten at a GREAT price and just used that. Change #1. *Note to self for future photography- Don’t take a picture of red meat on the red cutting board. 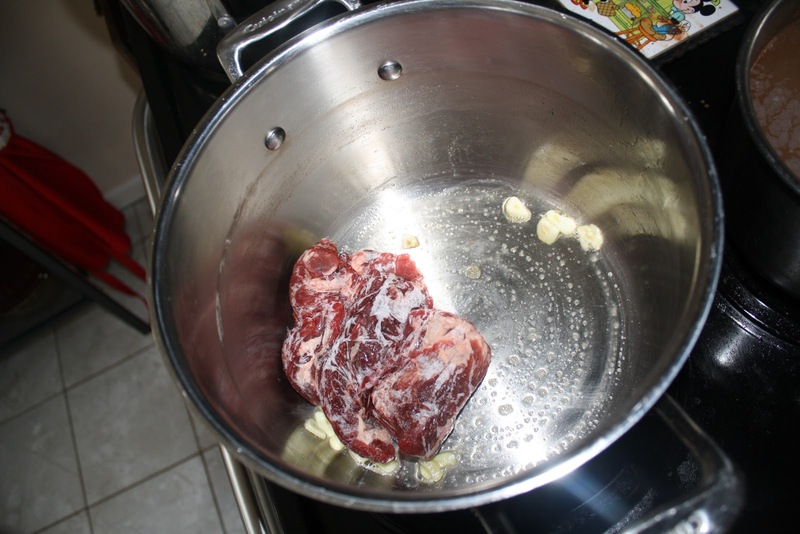 The next step of the recipe calls for browning garlic and then the meat in vegetable oil, then removing the meat, adding tomato paste, and then draining off the excess oil. I decided to just use butter, and leave it in there. 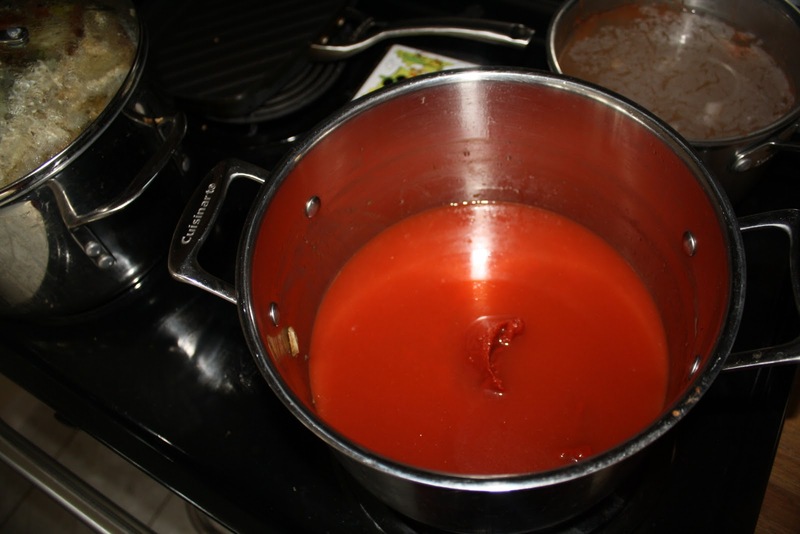 The sauce itself is made of 2 small cans ( oz) of tomato paste, 2 large cans (15 oz) of tomato sauce, and 2 15 oz cans worth of water. This would be the next step that I will tweak. 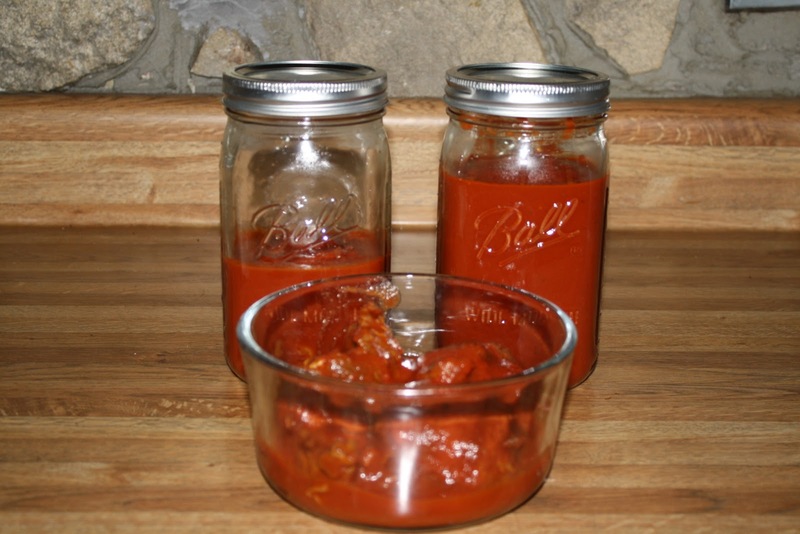 Next year I am hoping to can my own tomatoes and tomato sauce, so I can nix the canned stuff. *Fun Fact- The tomato cans for this recipe, clams, tuna are the only canned goods to be found in my pantry right now. Actually, they are usually the only canned goods in there. Back to the sauce. 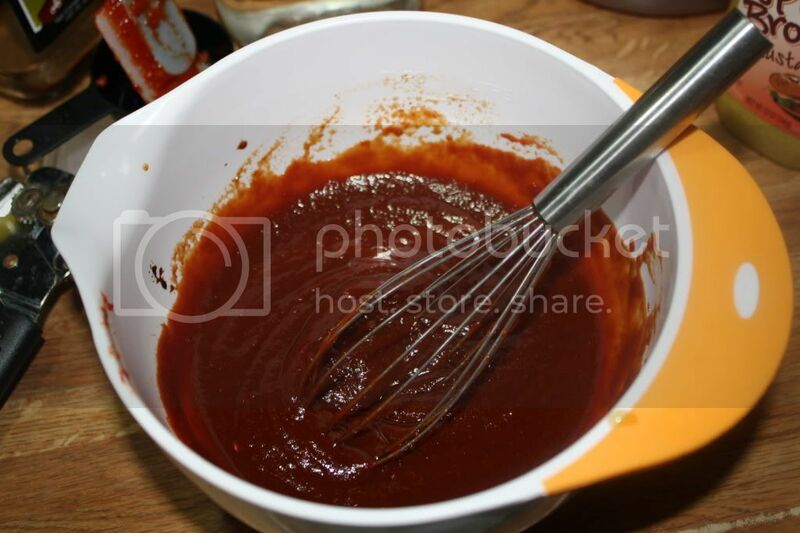 It all gets stirred up well, until the paste and sauce meld. Then it is seasoned. I like to use this sauce for macaroni and pizza, so I don’t over season it. 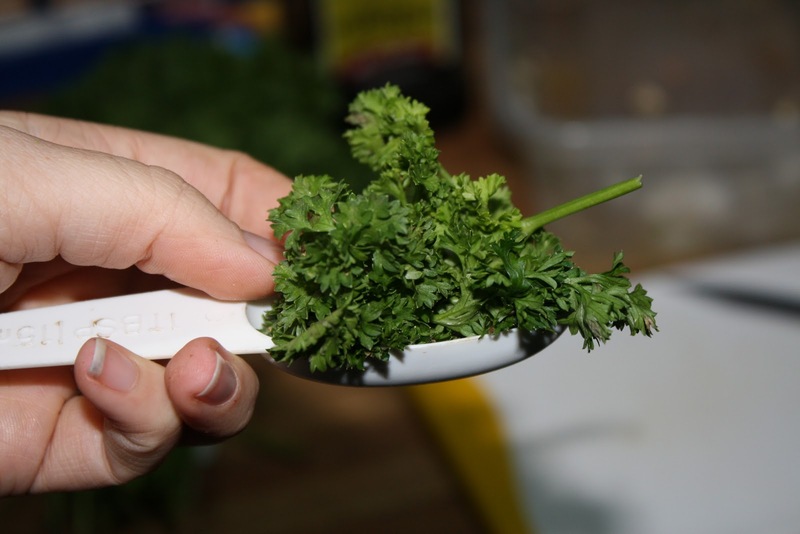 This batch had oregano, basil, sea salt, pepper, and fresh parsley (because that is the only fresh herb I have on hand). Add the meat back in and bring it to a boil. 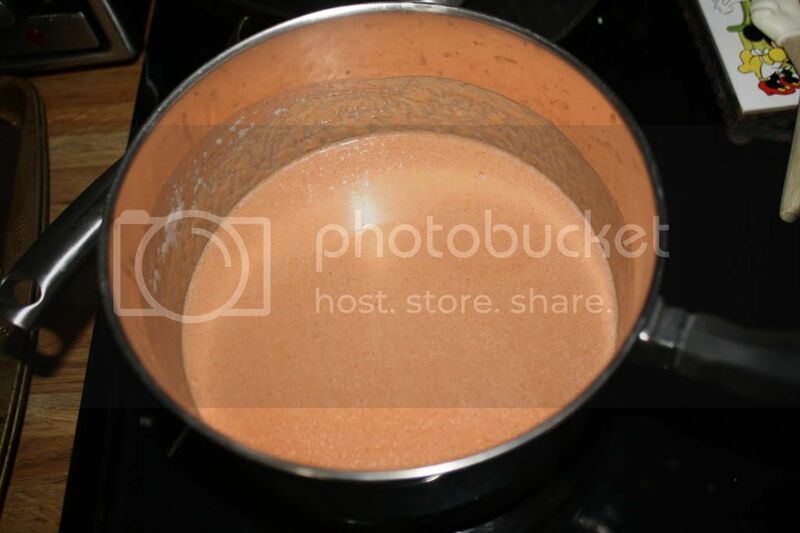 When it does, turn it to a simmer and let it cook until it is thick. 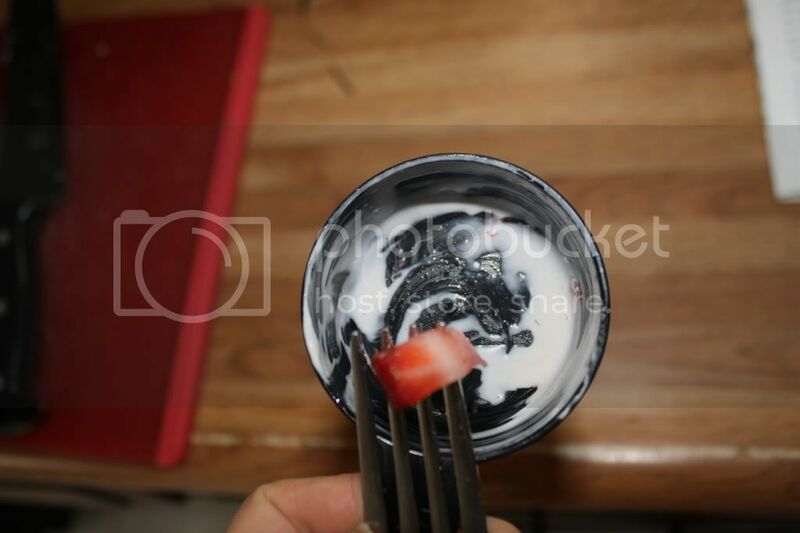 I leave the top 1/2 on the pot, since it can splatter. When it was finished, I scooped the meat out and then threw (read: carefully poured through a funnel) the rest into some mason jars. *Fun Fact- I needed to pick up another set of mason jars. Around our new house, EVERY SINGLE STORE has them. I mean, drugstores, big box stores, hardware stores, you name it. I was going shopping near work, however, which is about 1/2 hour closer to NYC. I just ASSUMED that the stores there would have them. Not so. Target and CVS had never heard of them. Shoprite looked at me like I was CRAZY for suggesting they might have it. As a last resort I ran to the hardware store near our old apartments only to find that it was closed down. Forever. Sigh. I had no idea there was such a small market for Mason Jars. Apparently I am a hick now or something. Oh well. I love it. 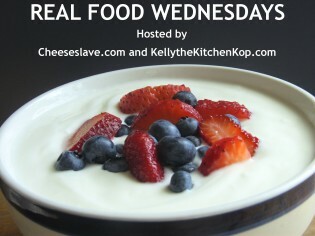 This post was featured on Real Food Wednesday with Kelly the Kitchen Kop and Fight Back Fridays at Real Food Renegade! 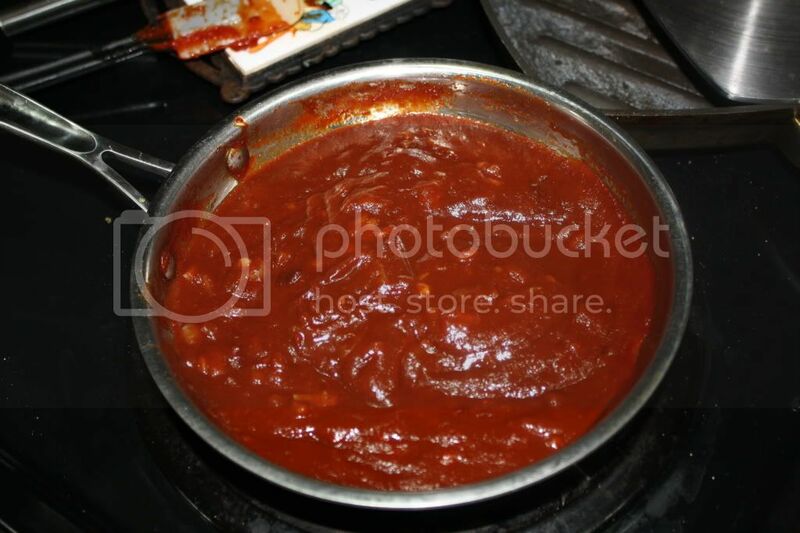 Categories: home-made basics, meat, sauce, tomato sauce | Permalink. 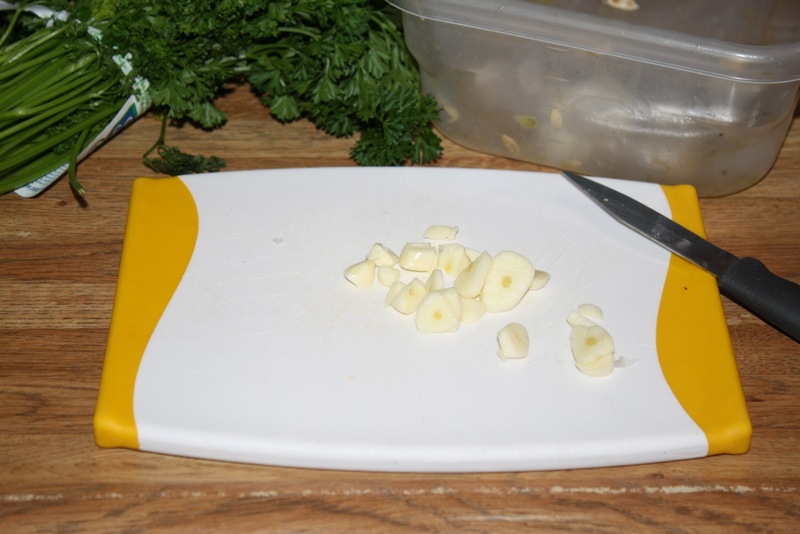 In yesterday’s compost post I mentioned that we use produce scraps in other recipes. This is one of them! 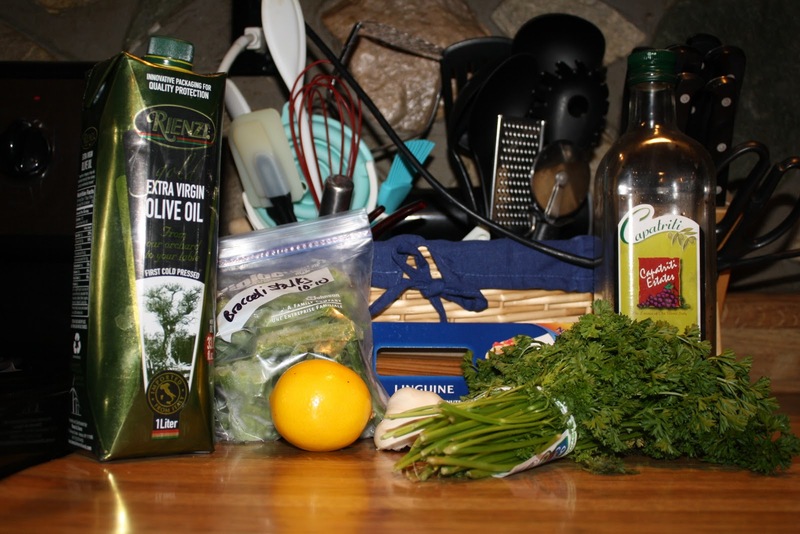 This pesto-esque sauce is so delicious, easy, and versatile that it has become one of our go-to recipes when I don’t feel like cooking. It also freezes quite well! First I gather the ingredients. When I chop of broccoli for roasted veggies I save the stems and freeze them. Any green veggie is really perfect. This time, I used some spinach that was starting to turn with the broccoli stems. Other than that, you need some parsley, olive oil, balsamic vinegar, garlic, and lemon. Although the vinegar, garlic, and lemon are all optional. 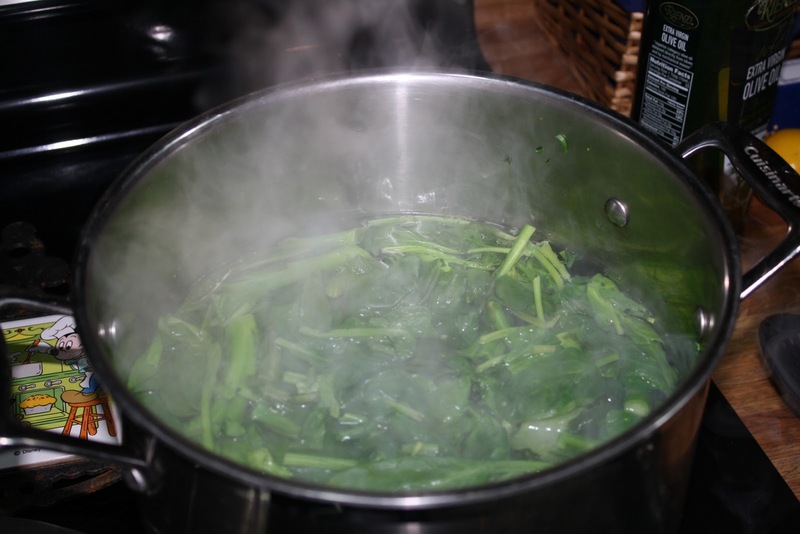 First, boil some well-salted water and plunge the broccoli stems (other other greens) into it. When they are soft, remove them. 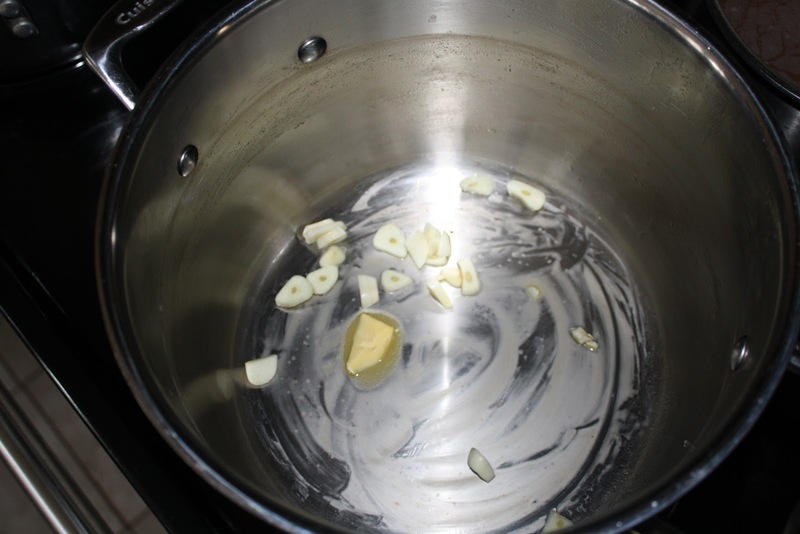 While that is cooking, smash up some garlic. The beauty of this recipe is that you can use as much or little as you want. 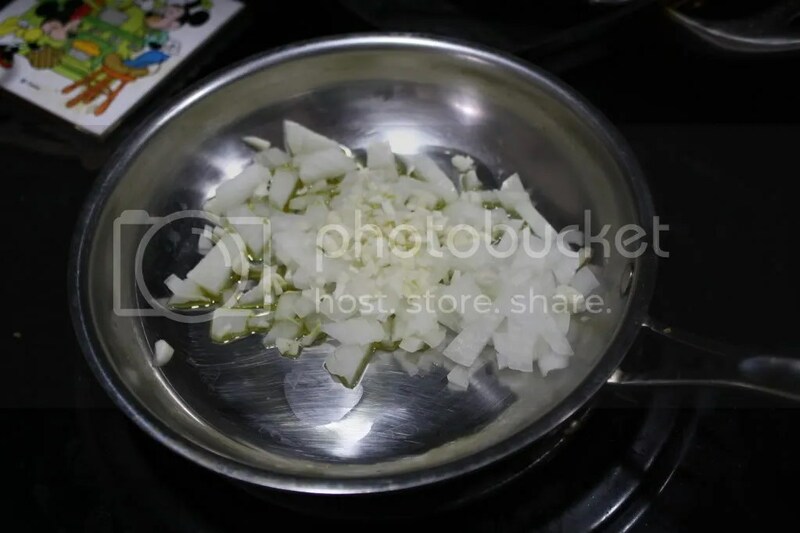 This particular time, we were going out afterward and did not want to be all garlicky, so we used only 2 cloves. In the past, we have garlicked it ALLL up. Your choice. 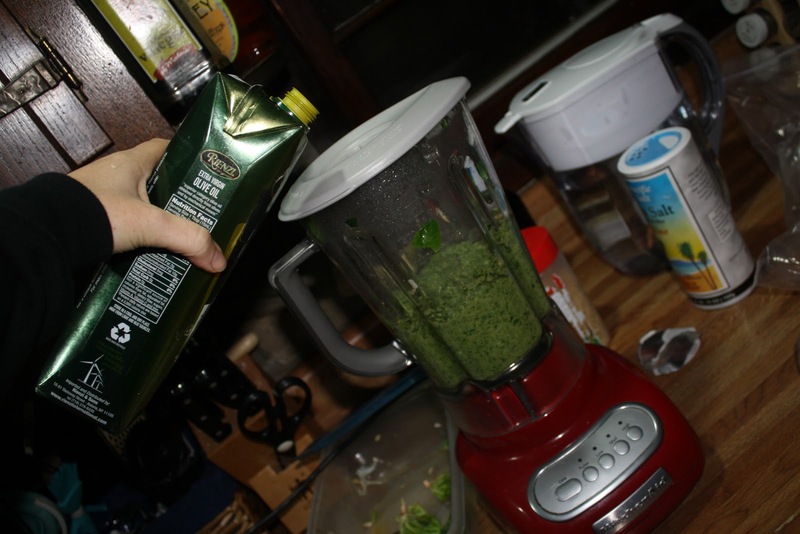 to a blender. I use about 1.5/2 Tablespoons of each, but depending on your mood you can make it a more garlicky sauce, a more vinegary sauce, or a more lemony sauce. 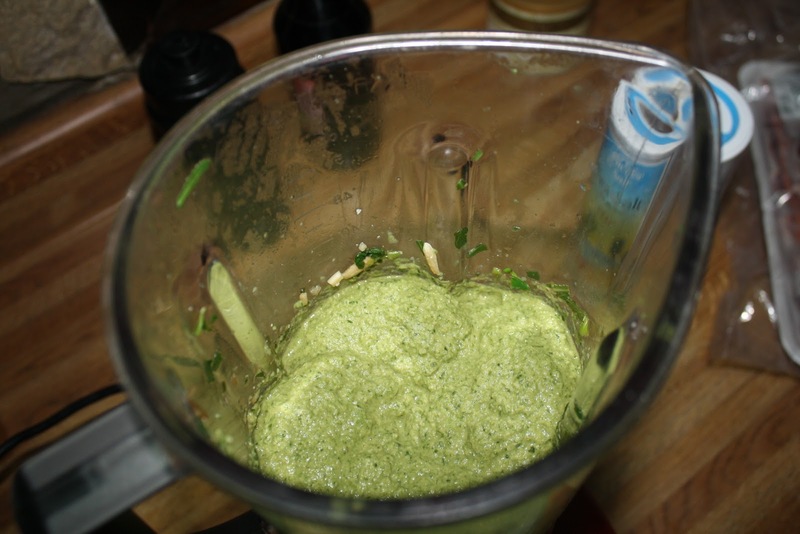 Once the broccoli is soft, add it to the blender. Mix, drizzling in Olive Oil to help it along and to get the right consistency. 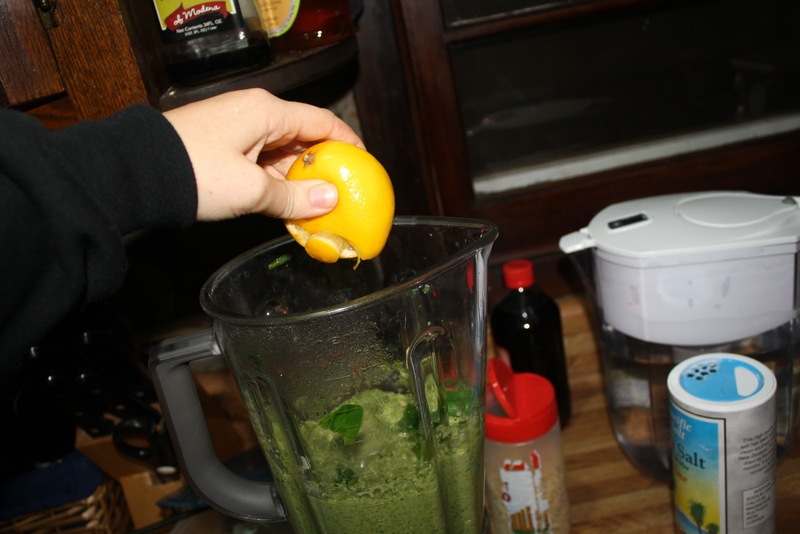 Squeeze some lemon juice on in there as well, to perk it up. As you can see, I also added some sea salt to the mix. When it is well-blended, you are done! Serve it with pasta (reuse that broccoli boiling water!) and freeze some for later! 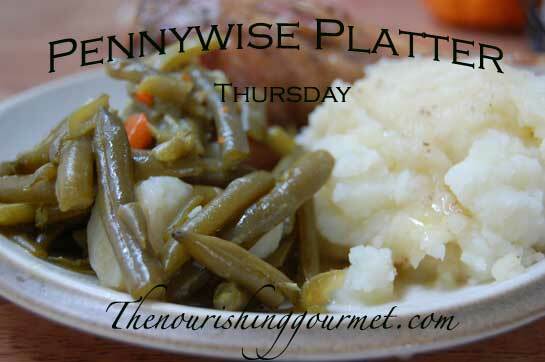 This post was featured on Midnight Maniac Meatless Mondays, Healthy Kids at Creating Nirvana, and the Pennywise Platter on The Nourishing Gourmet! Categories: broccoli, greens, macaroni, sauce, veggies | Permalink.